Want more ALAO conversation during the 12 long months between annual conferences? 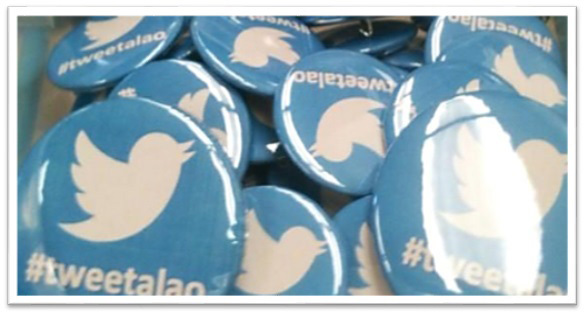 Session tweets revealed the only thing more popular than our #tweetalao buttons was discussion regarding a monthly Twitter chat. Join us for #TweetALAO, a brand new Twitter chat inspired by Engaging Tweets: Twitter as a Personal Learning Network at #ALAO2014. Diane Schrecker (@dschrecker) and Kaolin Tristano (@theleastshrew) will moderate monthly discussions on a wide variety of topics of interest to all academic library professionals, with special consideration for Ohio librarians. Our first chat will be Wednesday, January 21 at 8:00 pm. We will be talking about libraries, the New Year / New Term. To participate, just follow the hash-tag #TweetALAO via Twitter or Tubs. This entry was posted in Vol. 32 no. 3 (Dec. 2014) and tagged conference, Twitter. Bookmark the permalink.